Looks like you fixed that while I was typing or something. Sorry for my silly-looking comment! 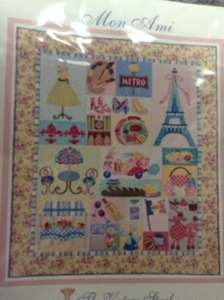 Love the baby quilt and the Paris quilt will be fabulous! 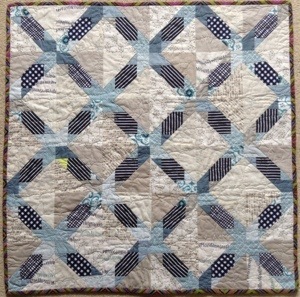 Lovely baby quilt, and I think the Paris quilt will be smashing! I don’t think I’ve ever read that you “machine quilted” something. I was quite surprised…lol Right now I’m crocheting some baby bootees. I have a new grandaughter who will be joining the family on March 10th. I probably will never meet her in person, but I’ll get to see pictures. Her name is Aylish Ann Trail. I hope you do get to meet your new granddaughter. I’m glad you like the baby quilt. It’s for a friend in the US. 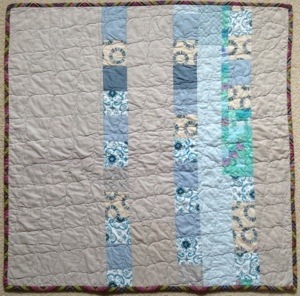 PS You’re right I don’t do much machine quilting. I don’t like it at all! Thanks Cheryl. It always nice to get feedback. 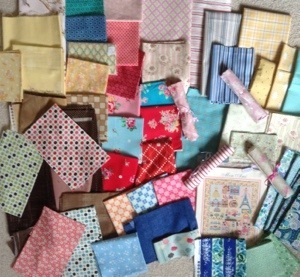 I’ll keep you posted of progress on the Paris quilt. Wondering how the Mon Ami quilt has evolved. Also, did you hand applique or machine applique? thank you for the reply. I am considering the Mon Ami but do not do hand applique and I do not know if her pattern will work for fusible machine quilting. I will check out your facebook page-love to see others’ finished products. Hi Kalyn, Sorry I didn’t reply earlier I’ve been a very bad blogger for the last 12 months. I have finished it and hand quilted it and the applique was hand done too. I don’t see why you can’t use machine applique. Good luck anyway.